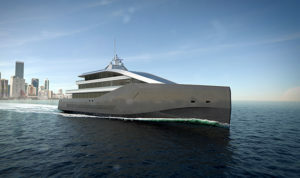 Rolls-Royce has unveiled a ground-breaking luxury yacht concept, named Crystal Blue, which has been designed to showcase the advantages of advanced ship intelligence solutions and hybrid propulsion based on LNG fuel and battery power in the marine leisure market. Introduced today during the Global Superyacht Forum (GSF) in Amsterdam, the Crystal Blue yacht and its attendant support vessel Blue Shadow have been developed to enable new thinking in yacht design and propulsion by optimising the yacht’s superstructure for greater guest use and comfort. One of the many novel features is the use of an intelligent dynamic positioning system which automatically controls twin azimuthing thrusters and a TT1100 bow thruster – technology that is usually found on offshore support vessels that must maintain their positions next to oil rigs to within a couple of metres. On board Crystal Blue, however, this system allows the yacht to remain in the right spot on the water – without using an anchor – and ‘follow the sun’ across the sky to ensure sunbathers can enjoy the “optimum tanning angle” while lounging on deck. At first glance, it seems Rolls-Royce has forgotten to include a bridge in the design but, as Levander explains, “it’s just been moved”. The bridge console is based on the Unified Bridge design that Rolls-Royce has already delivered to a number of ship types, including large superyachts. It also features technology Rolls-Royce and Svitzer demonstrated in the first remote controlled commercial tug earlier this year. The Rolls-Royce Blue Ocean team has also incorporated some novel safety features into the design, namely a ‘safe room’; a citadel in which guests and crew can seek refuge in the event of an unauthorised boarding. Once inside, the crew can override the controls and operate the yacht remotely or direct a shore-based centre to pilot the vessel. Designed for 12+ passengers and 12 crew, the 62 metre Crystal Blue is based on a composite or aluminium hull operating a power plant based on the Rolls-Royce hybrid LNG/Battery SAVe-CUBE system configuration. The machinery consists of twin LNG-fuelled 16V4000 MTU M65-N generator sets working in parallel with a battery bank to provide 1MWh of genset-free power during port stays. Two low-weight carbon Azipull thrusters provide propulsive power to achieve maximum service speeds of 20 knots. Although LNG fuel is increasingly specified for commercial vessels, particularly coastal ferries, the size of the fuel tanks and a lack of LNG bunkering infrastructure has been a major barrier to the yacht sector embracing the cleaner, odourless fuel. “This is where Blue Shadow comes in,” explained Henrik Alpo Sjöblom, Project Manager in the Rolls-Royce Blue Ocean team. Operating in convoy, Blue Shadow is a smaller 42 metre, remotely-controlled, steel-hulled support vessel used for transporting and launching the mother ship’s tender, helicopter and any other ‘toys’ that the yacht owner may have. It also allows designers to make better use of the aft area of Crystal Blue for guests, such as by including an infinity pool, or a beach area. The shadow boat also doubles up as the owner’s personal LNG bunkering barge. “Burning LNG has clear advantages over Marine Diesel Oil for the yacht sector,” said Sjöblom. “There is no smoke, it doesn’t emit any unpleasant odours or fumes and it meets stringent emissions regulations, allowing yachts to enter otherwise prohibited ecologically sensitive waters.